Can you make Fingerprint Jewellery in Gold? Have you been thinking about having fingerprint jewellery made? You may have noticed that it is mainly available in silver. I get asked a lot for gold fingerprint jewellery but the issue has always been the price. The problem is that gold is very expensive – but what if there was an alternative solution? Are you considering investing in gold fingerprint jewellery? Do you love the idea of fingerprint jewellery but usually find it’s made in silver, which you don’t wear? Have you looked online and found that gold fingerprint jewellery is possible, but the price tag is way over your budget? At Impressive Memories, my aim is to create beautiful, high-quality products. I pride myself on using the best materials and creating work of a very high standard. At the same time, I also appreciate that budget is important. A solid gold hallmarked, fingerprint charm will cost approximately £500 to make. There are many jewellers who can do this for you. 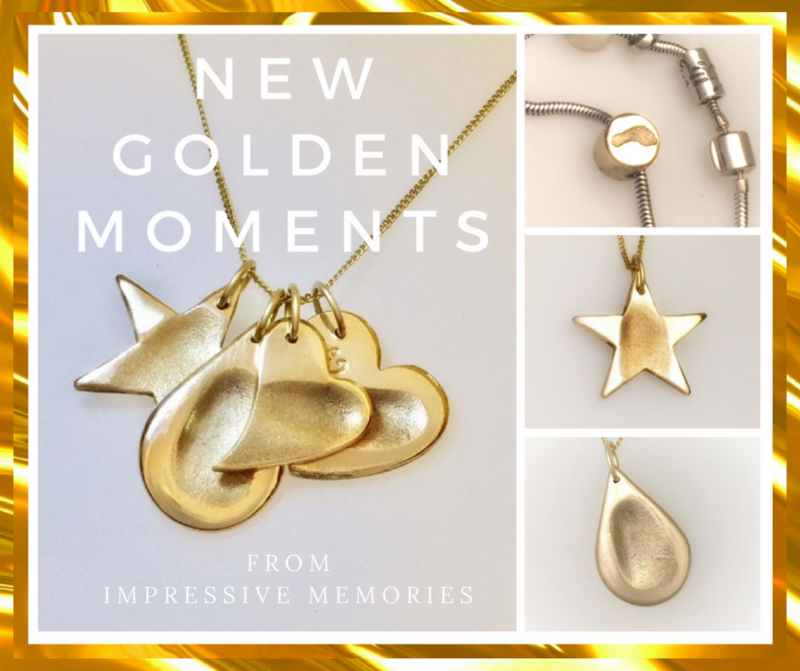 My solution gives you a golden charm with all the beauty of gold but will cost you much less, almost a tenth of the price – Golden Moments charms start at just over £50. I made gold fingerprint jewellery affordable: How? My Golden Moments range is not a precious metal. Charms do not need Hallmarked. They are a solid golden metal alloy, not plated, the ‘gold’ will not wear off. All metals will tarnish – this will too – but a cleaning cloth and a gentle wipe will bring it back to its shining glory (I’ll give you a free cleaning cloth). I can make you a charm in genuine gold using a similar technique to silver, but it would cost approximately £500 to make. Alternatively, fingerprint charms can be made in gold using a much older technique. The process of ‘lost wax’ is thousands of years old…a beautifully skilled method. Again, the cost for a gold charm is usually around £500. If you have that budget then there are many excellent businesses who can make you a gold, fingerprint charm. Hallmarking is another cost implication. Any gold jewellery over 1g in weight must legally be hallmarked (the legal weight for silver is higher at 7.78g). The Edinburgh Assay website can answer all those questions. Last year, I made silver memorial fingerprint jewellery for Pamela, with her mum’s prints. She loves her charm, but all her jewellery is gold. We chatted about the issues with gold and Pamela was keen to order – but I was keen to find an alternative! As I explored my new product I made samples using Pamela’s mum’s prints, then surprised her with what I’d made. I gave her a free charm to wear and we’ve worked together for several months now to ‘road test’ my Golden Moments. I needed to know how the charm coped with day to day life. Would it tarnish? Would it discolour? Would it react with our skin? Would it scratch? Until I had these answers, I wouldn’t be selling Golden Moments. Are Golden Moments right for me? You need strong, hardwearing jewellery that goes where you go – in the shower, swimming, chewed by your todder…yup, they ALL do it! Your baby is too young – choose a mini print or wait a few years! From the comfort of your home, you can order your Golden Moments charm today. I can post out a kit for you to capture the prints that I need, so distance is not a problem. Or you’re more than welcome to make a booking and come and visit me, and I can take the prints for you. Why do I wear Fingerprint Jewellery? As a proud mum, I wanted to wear jewellery created by my most impressive creation – my daughter. Jewellery is such a personal thing. It can be hugely sentimental, it can tell you a lot about the person wearing it. We wear it to show our beliefs and values, personality and status. It can be loud or subtle, bold or hidden. Our jewellery often makes a statement about who we are, and who we’re not. Fingerprint jewellery is a popular way of creating a sentimental piece of unique jewellery. When you wear it, you feel as if you are touching and holding part of the person who created it. It could mark a baby milestone, commemorate a happy event or create a lasting memento of a loved one. Whatever your choice, it is also special to know it is a one off piece, made just for you…not a mass produced catalogue number from Argos. Predominantly fingerprint jewellery is hand made using a form of silver that allows every swirl and whorl of our unique fingerprints to be pressed into the precious metal. Popular with mums and growing in popularity as a bereavement keepsake. I’m going to be working on a rose gold finish – are you a rose gold fan? Which designs do I currently make in silver that you’d like to see in gold? Have you any new ideas that you’d like me to make? Comment below and let me know! I might need more ‘road testers’ and maybe you can help?